Throughout thousands of Gartner inquiries, surveys and forecasts since 2016, it has become evident that cloud computing is now one of the key components of most IT organizations' strategies. Software vendors are moving to a cloud-only strategy for their new products and services, with most geographic regions around the world seeing the establishment of hyperscale cloud providers — if not in their country, then within their wider geographic area. 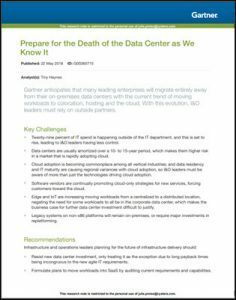 This raises the question: What will be the fate of the corporate data center? The corporate data center is increasingly seen as unnecessary. In Gartner inquiry, we commonly hear the aspiration "I want to move all my workloads to the cloud." In some cases, the corporate data center is viewed an obstacle to achieving the IT agility organizations are being forced into in the online world. When asked for the motivation behind the desire to move everything to the cloud, a large percentage of organizations are looking to "get out of the data center business," and place workloads where they are most effective in providing an agile, responsive infrastructure to their business. Download the new report from Gartner, courtesy of Cyxtera, to learn more about the changing data center landscape, and the impending move away from on-premises data centers.